Get to the root of your cat's nighttime howling. 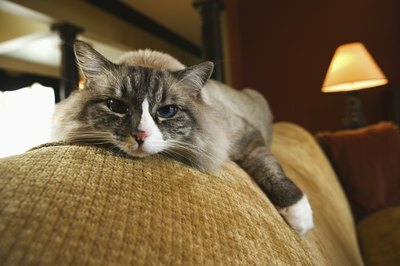 One of the most common causes behind persistent nighttime vocalization in cats is the heat cycle. If your unfixed female cat is in estrus, she very likely will "call out" to tomcats in the area, letting them know she is ready to mate. This vocalization is especially frequent at night -- much to cat owners' dismay! The yowling can be very loud and piercing, so it may be a good incentive to spay your queen immediately. Not to mention the other benefits associated with spaying your noisy kitty, from improved health to keeping pet overpopulation under control. Excessive nighttime howling is particularly problematic for senior felines. This howling can be related to simple fear. For example, elderly cats often have poor vision. Their ears don't work as well as they once did. Something on their body may hurt. The vocalizing may just be a way for them to express their fright when they're alone and it's dark, quiet and scary outside! Although cats often seem independent and aloof, at the end of the day most of them truly are just sweet little love bugs! When the entire house is quiet and still at night, your lonely cat may howl just to wake up someone up and get some attention. Instead of thinking of it as a nuisance when you're sleepy, look on the bright side and think of it as endearing -- your pet enjoys your company. Some cats are on the spoiled side and get used to enjoying meals and treats during the daytime hours. If your cat is howling all night, she may simply be trying to get you to wake up and give her something to eat! Cats are prone to anxiety and stress, especially when they experience major life changes. Some examples of traumatic changes for cats include a new pet in the home, moving away or the loss of a companion. Try to be especially understanding toward your loud kitty if this applies to her -- she's going through a lot! With time and adjustment, the behavior should diminish. No matter what your cat's age is, nighttime vocalization could also be an indication that she just isn't feeling well. If you are scratching your head as to why your cat is howling so much, take her to the veterinarian immediately. Persistent vocalization in cats is often linked to a variety of medical conditions, including hypertension and thyroid issues.